The taco game in the Macheesmo home is strong to quite strong. This is known. The truth is that in my house we love damn near any taco. It can be a simple beef and cheese situation or something more complicated. If it’s in a tortilla, there probably won’t be leftovers. While those tacos are smooth and buttery, these guys will punch you in the face. They are coated in a nice layer of a homemade blackened spice that almost crunches when you bite into it. 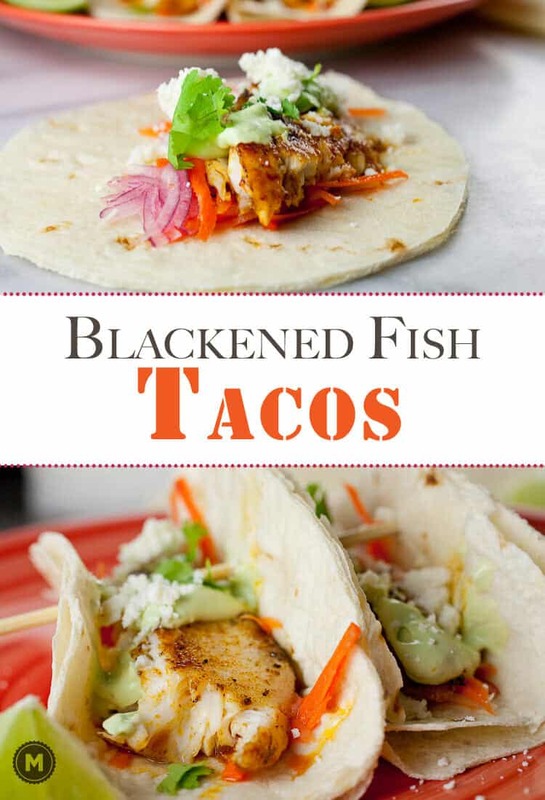 It’s a new fish taco game, for sure. Blackened Tilapia Tacos topped with a spicy avocado sour cream sauce and a quick pickled radish slaw! A great light taco with lots of flavor! 1) Combine paprika, garlic powder, oregano, onion powder, chili powder, cumin, salt, cayenne, and brown sugar in a small bowl. 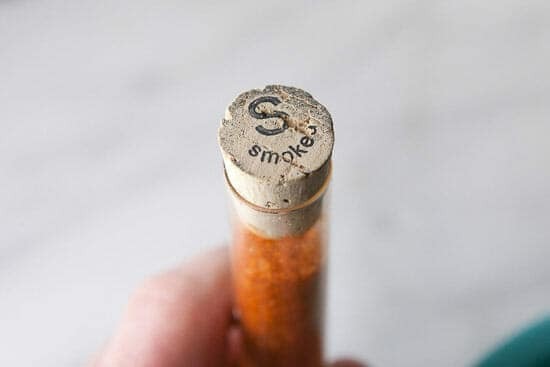 If you happen to have some smoked salt, add a pinch but I don’t think I would buy it JUST for this recipe. 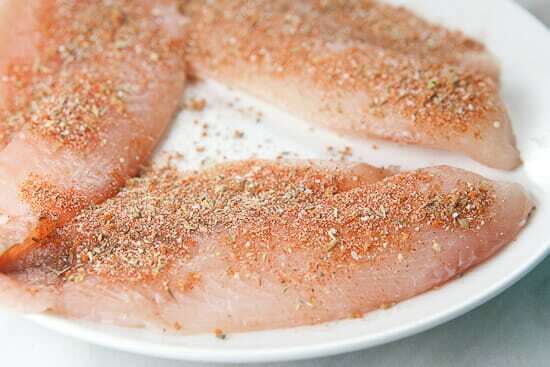 2) Once combined, sprinkle spice mix on both sides of tilapia filets. Use a liberal hand. It should cover most of the fish. 3) Heat a large skillet (cast iron or nonstick) over medium-high heat and add a drizzle of oil. Once the oil is hot, add fish filets and cook for 3-4 minutes per side until the fish is blackened around the edges and flakes apart easily. Keep fish warm until serving. 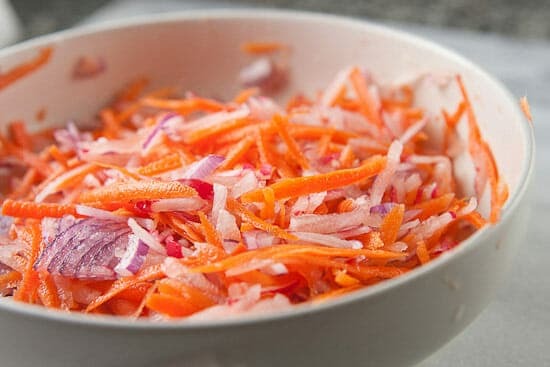 For slaw: Grate radishes and carrots and toss together with sliced onion and lime juice. Season with salt and pepper. It’s best to let the slaw sit for 10-15 minutes if possible. Drain off any liquid before making tacos. 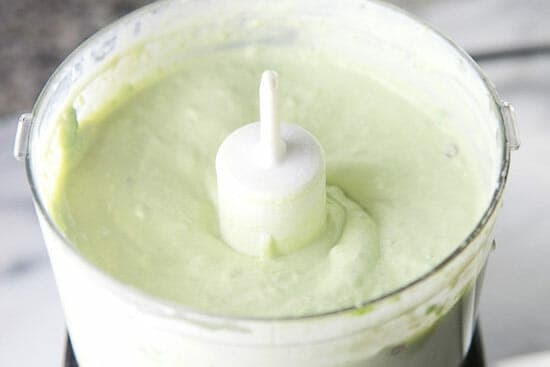 For avocado cream: Combine ingredients in a small food processor and pulse until smooth. You can also mash up avocado and stir in ingredients for a slightly chunkier version. Warm tortilla in a 250 degree oven and serve fish in tacos with slaw and cream sauce. Garnish the tacos with fresh cilantro and crumbled cotija cheese. I know… it looks like a long list of ingredients, but most of them are pretty basic. 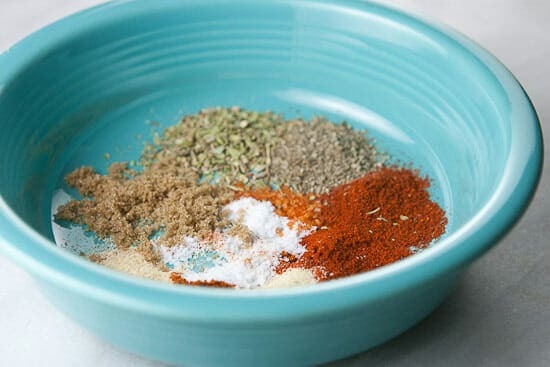 If you wanted to you could sub out the spice mix for your favorite Cajun or blackening spice, but it’s not too hard to stir together on your own. The one tricky spice is smoked salt. This stuff is ridiculously strong and I use it very sparingly. It has a really deep flavor though and a small pinch goes well in a spice mix like this. You can leave it out if you can’t easily find it though. No bigs. Stir all the ingredients together and add a big pinch of brown sugar. That will sort of caramelize on the fish and give it some good color. Lay out your fish and sprinkle them liberally with the spice mix. They should be pretty heavily dusted. Don’t worry about over-seasoning them. Some of the spice mix will fall off as they cook. 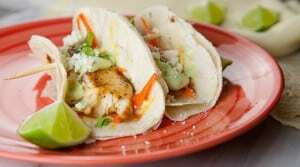 Tilapia really is a great choice for these tacos so it’s what I recommend. It flakes really nicely and cooks quickly. The other option which would be good is salmon, I think. There are two side dish components to these tacos: a slaw and a sauce. The slaw adds some fantastic crunch to the tacos. I just used a bunch of radishes, carrots, and some red onions. If you wanted to bulk up this slaw a bit more, you could add some very finely chopped red cabbage. I thought it was good like this though. 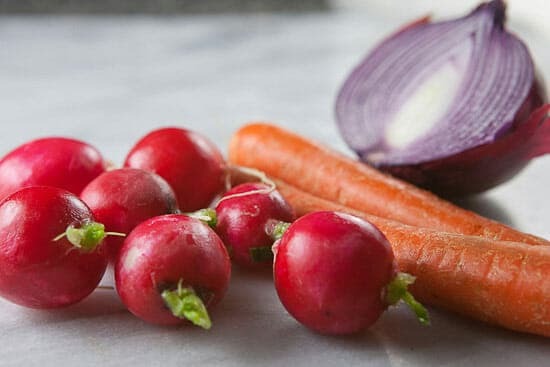 Just run the carrots and radishes through a box grater and slice the onion very thin. Then toss it together with the lime juice and a pinch of salt. It’s best if you can let this sit for a few minutes before serving. The salt will pull out some liquid for the veggies so drain it off before serving. You don’t want a lot of water in your tacos. The avocado cream is the perfect balance to the slaw. It’s smooth and buttery but has a Serrano pepper in it also for a little spicy punch. If you have a mini food processor, just pulse it up until it’s smooth. You could also just mash up the avocado and stir everything together though. 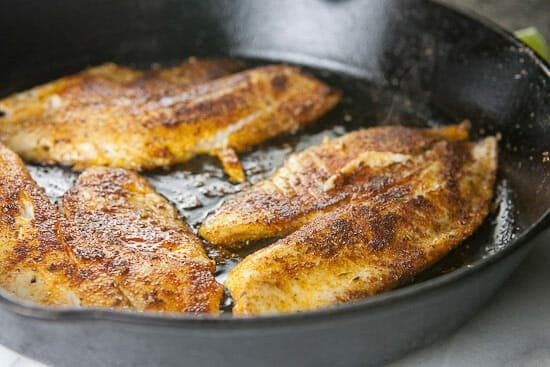 You can cook this fish is almost any skillet but a cast iron skillet or nonstick skillet would probably be the best. Cook them over medium-high heat with some neutral oil. The fish will cook really quickly once it hits a hot pan. 3-4 minutes per side and you should be in business. The fish is done when the spice mix is blackened and the fish flakes apart easily. You know the rest. Pile this stuff on warm tortillas and garnish with some cilantro and cotija cheese. A really nice taco twist and seriously can be on the table in under 30 minutes. It’s fast and delicious. Add it to your taco menu, people! Thanks for the comment Massy! They didn’t last long at our house! Made these yesterday for my daughters 6th b-day. They were a huge hit! Easy and delicious!